Suhoor is the first meal that one needs to have before dawn. It should be a perfect mix of carbohydrates, proteins, and high-fibre foods. Suhoor should provide enough energy to withstand long hours of fasting. 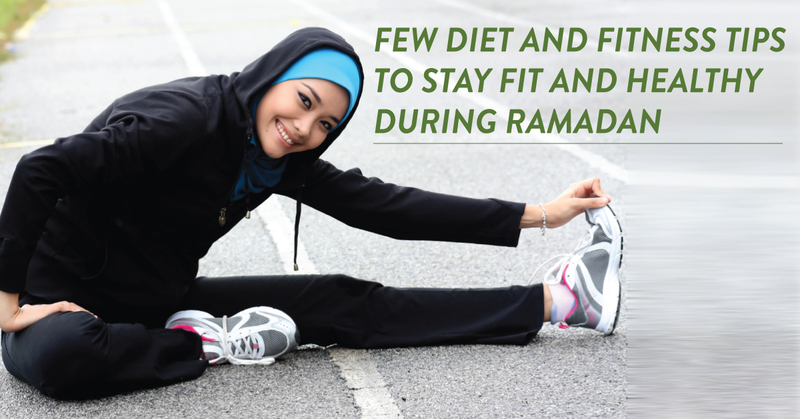 When it comes to fitness, don’t use Ramadan as an excuse to refrain from exercising. However, too much of exercising is also a big ‘no-no’ during this period. Instead of long runs, try going for a short run or a brisk walk. If you have some health issues like diabetes, it is better to refrain from exercising. The ideal time to perform workout during Ramadan is just before ‘Suhoor’ or late at night after having your ‘Iftar’ meal. Also, make sure to drink a lot of water and wait for half an hour before exercising. After a long day of fasting, you feel like eating whatever that comes on your way. However, it can affect your health in the long run. It is recommended to break your fast with water, raw fruits, raw vegetables, yoghurt, or dates. Avoid indulging in large portions of heavy or oily meals. Many doctors suggest consuming certain multivitamin tablets to ease the metabolic challenges of fasting. These tablets will ensure your body continues to get everything it normally does. An omega 3 fish oil supplement can improve the brain functioning during the day. Magnesium can ensure a good night’s sleep. Fitness World wishes everyone a BLESSED and HEALTHY Ramadan!